TWTW: January 11th through 17th 2016 COMPUTER BROKEN! Half way through Monday suddenly my work laptop’s screen went blank. After a second it popped up a drive error and then went to the BIOS. There is a menu in most bioses, biosi, bioseseses? anyway you tell the computer what you want it to boot up from. When I looked in my BIOS no options to boot from existed. I appeared the drive had disappeared. When I checked the hardware settings the drives (it has 2) showed up. I grabbed a bootable Windows 10 USB disc from the IT guys and set about trying to fix my poor laptop. I tried to do everything I could to repair or fix my Windows. Nothing worked. I couldn’t restore. I couldn’t fix the master boot record. Nothing worked. On top of that everything took forever. The computer seemed to be walking through molasses. I decided to just re-install Windows. I had everything important backed up. I made my big mistake when I decided to just use one of the existing partitions on the SSD instead of formatting everything. I spent Tuesday getting Windows installed and setting up all my work stuff on the computer. During the process I could tell something didn’t seem right. Everything went very slowly. The laptop which used to take maybe ten seconds to boot up now took over a minute. I noticed all sorts of disk errors in the log. After struggling for a day I tried to fix these problems on Wednesday afternoon. I decided to scan the discs to see if I could find any problems. The second I tried the computer went blank and went right back to the BIOS. This time I decided to do things correctly. On Thursday I low level formatted both discs and then checked them for errors. None showed up so I re-installed Windows 10 again from scratch. By Friday I had everything installed and set up. The discs were not complaining in the error log and the laptop was back to booting up in seconds. Fingers crossed I actually fixed something. Like last Sunday, this Sunday was extremely cold. 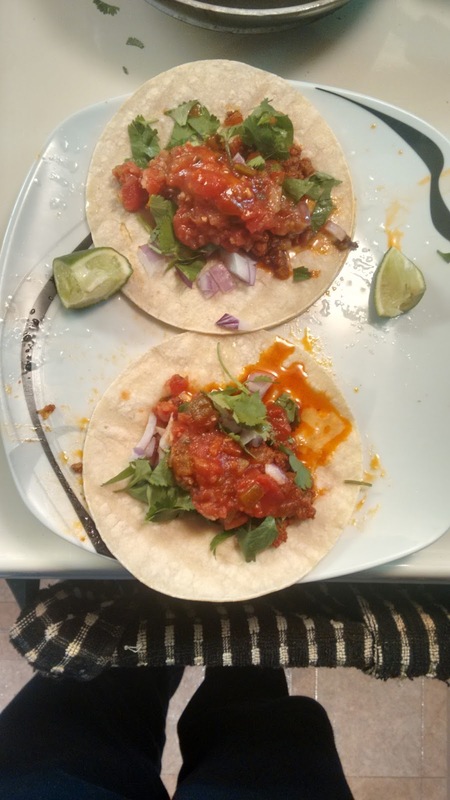 Instead of making chili like last week this Sunday I chose to make chorizo tacos and imagine I was spending the day somewhere warm.